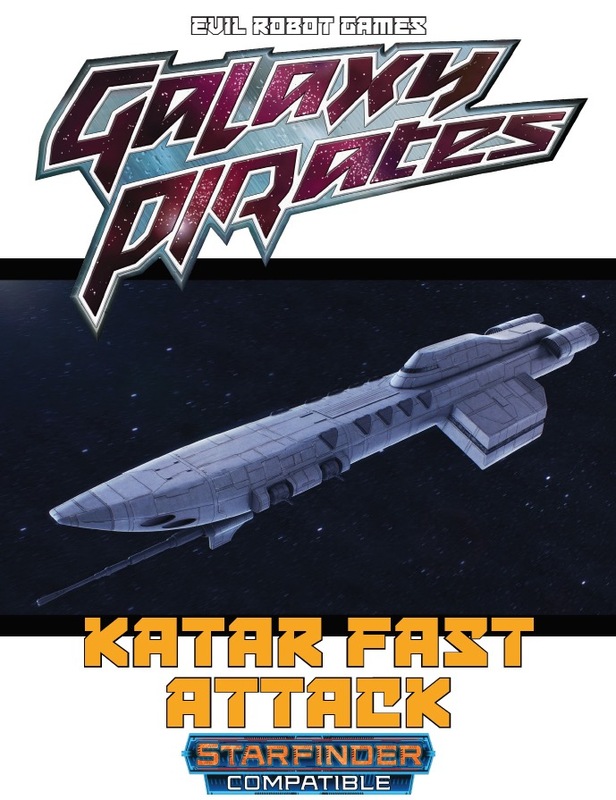 The Katar Fast Attack ship is commonly used in outer system defense and piracy interdiction roles. It carries heavy torpedoes, particle beams, laser weaponry and advanced defensive systems. 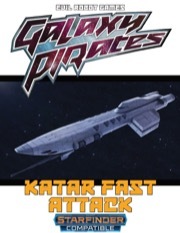 The Katar Fast Attack: a Tier 8 vessel, includes a full primary stat block with crew skills. and predetermined Scan Results. This Galaxy Pirates supplement clocks in at 7, 1 page front cover, 1 page SRD, leaving us with 5 pages of content, so let’s take a look! So, the fast attack ship of the Katar is a tier 8 Large Destroyer that comes equipped with a pulse prismatic power core, a basic drift engine and mk 4 armor as well as mk 6 defenses. The ship uses a mk 2 trinode computer, good crew quarters and basic medium-range sensors. Expansion bay-wise, we have 3 cargo holds. Weaponry-wise, we have a particle beam and heavy torpedo launchers facing forward; aft features a light torpedo launcher, while port and starboard feature a laser net. The turret features a light particle beam. With a speed of 10 hexes, these ships have the equivalent of L10 thrusters. With 200 shields, slightly skewed towards forward and aft, the ship has some staying power. Crew-wise, this one has a captain and pilot, 3 engineers, 6 gunners and 2 science officers; the crew is generally pretty capable, with +21 in Bluff and Diplomacy making for high values. The Piloting is similarly high at +21. The pdf does come with a Computers-table that allows PCs to know things about the vessel, but it should be noted that the table contradicts the ship’s statblock: The table states it has 2 cargo holds, when the statblock notes 3. This is a pretty minor hiccup, though. If you’ve been doing your math, you’ll realize that this ship does use its full PU-budget, which makes sense. As always, we get a filled-out version of the cool ship-sheets featured in these pdfs, and a one-page handout-style artwork of this cool ship, as well as paper-mini-style versions. The star here, though? The full-color map that does show the respective weaponry, the quarters, etc, including a katar garden and the like – it is gorgeous and really cool. Editing and formatting are very good on a formal and rules language level. Layout adheres to a two-column full-color standard, and the artwork featured is gorgeous. The cartography is awesome and full-color and makes the ship feel plausible. The pdf has no bookmarks, but doesn’t need any at this length. Paul Fields and Jim Milligan deliver a great little supplement here. The sleek attack vessel feels like the equivalent of a lancer’s attack vessel, and makes great use of its budget. The aesthetic components are top-notch, and as a whole, I consider this to be well worth getting. As such, my final verdict will clock in at 4.5 stars, rounded up for the purpose of this platform.